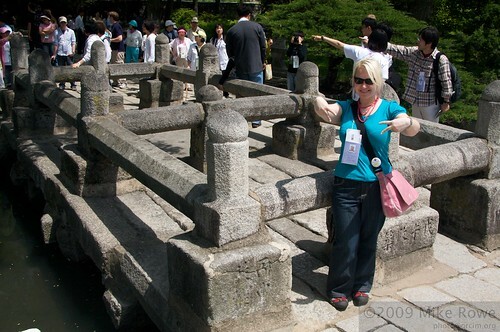 Part 2 of our Kaesong Adventure. Following our lunch at Tongil Restaurant it was time to recommence tourism duties. We piled back onto buses, us up back, minders up front. Another lecture on not taking photo’s of normal everyday street scenes, and off we went. 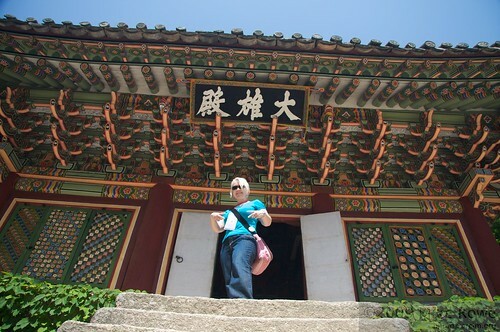 First stop (of the afternoon at least) was the Sungyang Seowon, a Confucian shrine and academy. 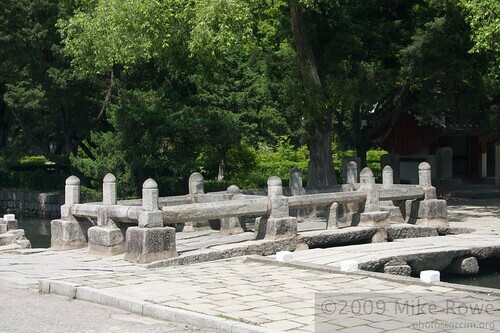 Well, what used to be a Confucian shrine and academy. Now a museum to show to foreign tourists. Our tour guide around here (no English of course, but we had bits of it translated for us). 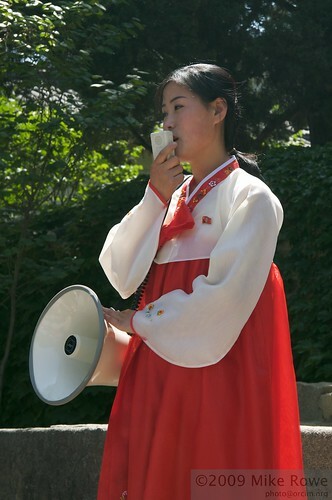 They do say that North Korean women are more beautiful than those from the South. Following our (brief) visit to Songyang we moved on again. This time no matter what our guides did they couldn’t avoid the classes of Elementary kids looking, waving and smiling at us. Unfortunately no pictures (sense a trend here? ), but really they looked and acted much like South Korean kids, except for the red neck ties. 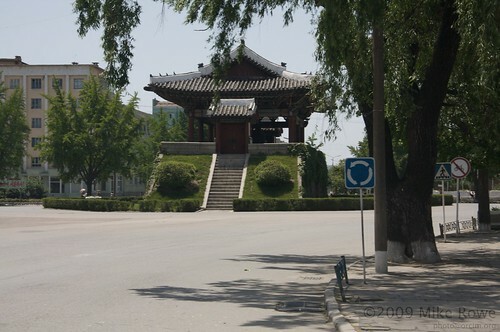 We moved on to another famous Kaesong sight, the Sonjuk bridge and Pyochung Pavilion. Of course being a national treasure, it deserves a “kimchee” photo. 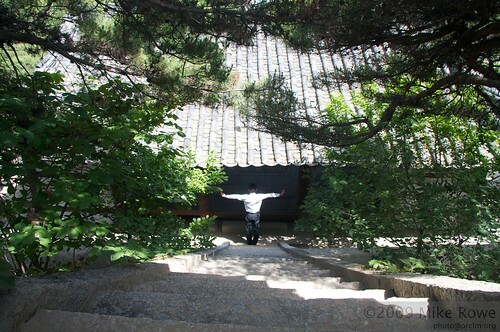 Just over the road from the Sonjuk bridge is Pyochung Pavilion which was built during the Joseon dynasty. 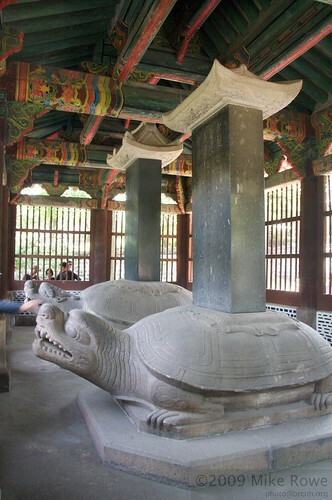 A small wooden pavilion is home to 2 enormous stone stele standing on the back of huge stone turtles. 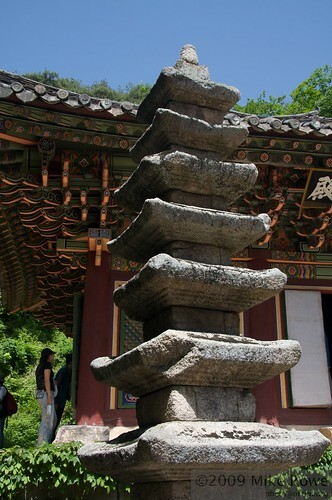 Wikipedia tells me that one stele was erected in 1740 by King Yongjo, the other by King Kojong in 1872. 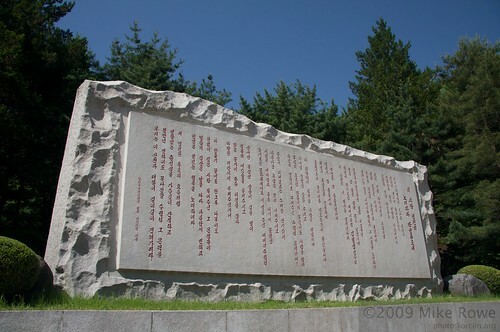 Both commemorate Jong Mongju’s assassination. 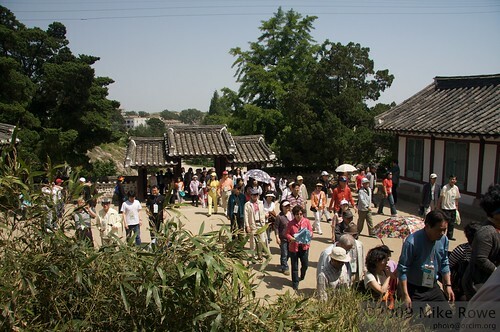 Drawing towards the end of our day, our final stop was the Goryeo Museum. A museum which which a bit interesting with old pottery and the like, was much more interesting on the outside, and within its gift shops. 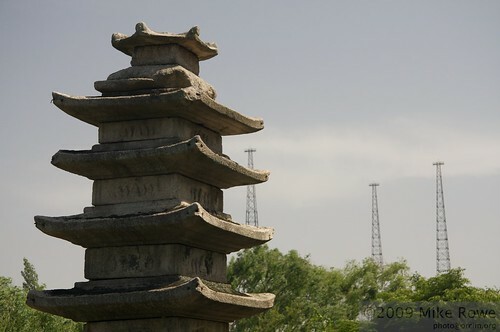 A seven storied stone pagoda in front of much more modern communication towers. 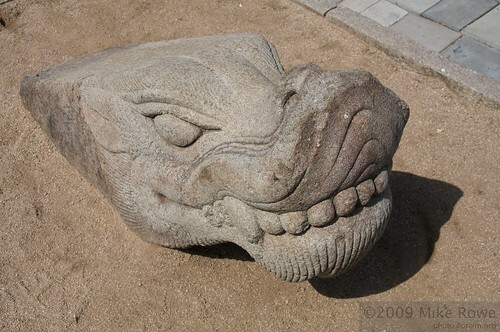 And more interestingly, a dragon head jumping out of the sand infront of a pavilion. 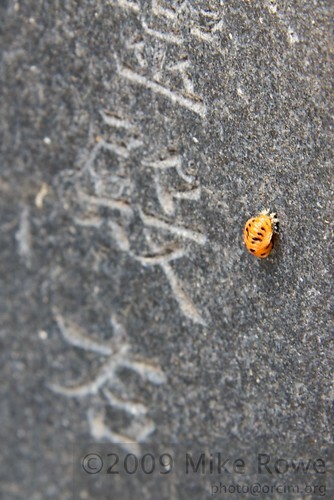 Following our visits to sights of Kaesong, it was time to head back. Not quite back to the South yet, a small drive through the Industrial Complex that is a join North/South venture. Interestingly it looked straight out a game of simcity, with large city blocks, a perfect traffic light network but no traffic, wide streets and footpaths with no pedestrians etc. Very much like the artificially constructed city that it is. 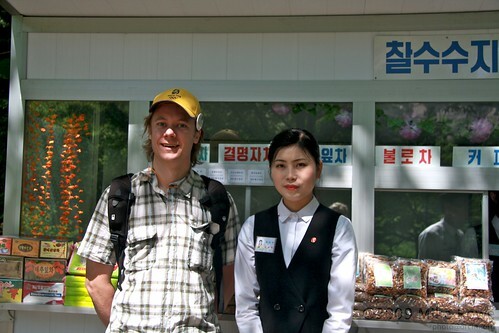 North Korean immigration was interesting, with specialised photo police who scan all your pictures and demand you delete any they don’t like or deem to be inappropriate. Guess nobody has told them that it aint rocket science to recover photo’s. Returning to the South through the DMZ is a bizarre experience, back to the relative safety of South Korea, the country we call home. Still, if you get the chance to visit, 100% recommended. Next stop North Korea! Kaesong City here we come! Actually 1 year ago exactly these were the thoughts. 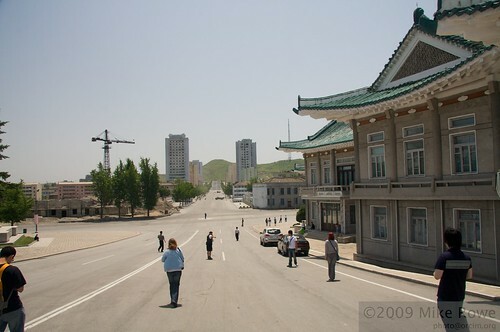 We were headed into North Korea and to the city of Kaesong (Gaesong), courtesy of the fine folk at Adventure Korea. After a short night in a hostel we awoke at 5am in order to meet out tour group at the ungodly hour of 6am. Its actually not very far at all as the crow flies, but in terms of travel time it takes forever. 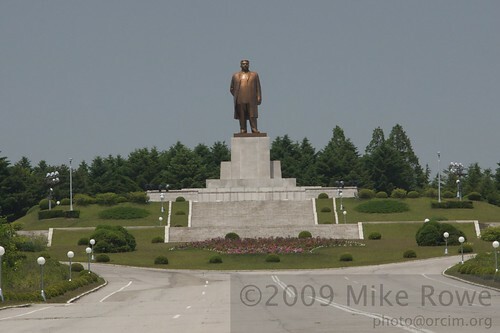 Seoul to the DMZ is less than 50km from the DMZ line, and Kaesong is only just over the border in North Korea. Probably only 60km total distance, but that didn’t mean it would be fast. 1 hour in seoul traffic to Imjingak, the South side border and immigration point, an hour or so of “administration” time (being the foreigners we must wait for all the Korean groups to go though first). The actual trip through the DMZ was only about 15 minutes. No traffic, just our convoy of tour buses. No photo’s at all allowed unfortunately. If you do, you might be lucky and only have them deleted, or you might be unlucky and get hit with the fine. They don’t talk about what happens if you are really unlucky…. Another 30 minutes or so of North Korean immigration and we were on the way. First things we saw (no photo’s of course) were the huge power lines leading into the Kaesong Industrial Park, a joint North/South industrial project (since paused thanks to the tension). Back onto the bus, and with more strict anti-photo warnings, we headed to Bakyeon Waterfall and the ancient Gwaneumsa Temple. 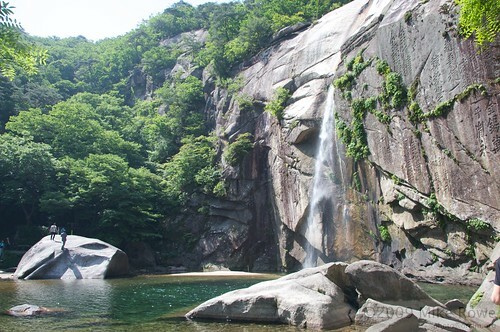 5 minutes walk up the trail, past the tourist hotel and snack stands we arrived at Bakyeon waterfall. As the group of foreigners we rushed up there to beat the crowds. Only a limited number of tourists are permitted each day, and it felt like they were all behind us. Mission accomplished. We made it and had a few minutes to ourselves, peace and quiet in the hermit kingdom. Once the crowds started to arrive it was time for us to move on and stay ahead of them. 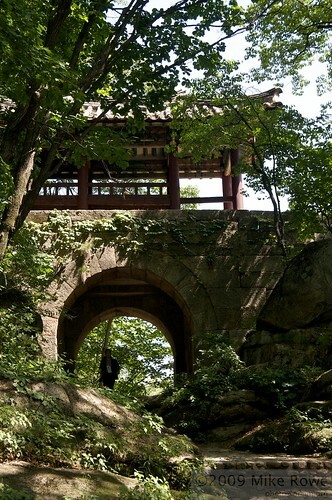 Continuing up the trail we arrived at an ancient stone wall and some pavilions. 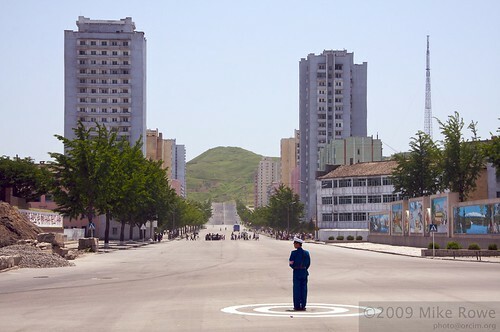 One thing you notice in NK is the tourism shops that pop up selling souvenirs. Every 5 minutes no matter how remote you seem to find one. Unusually the lady staffing this one didn’t object to me taking a photo with her. If you look closely you’ll see her Kim Il Sung communist party pin on her vest. Onward up the trail to the temple. 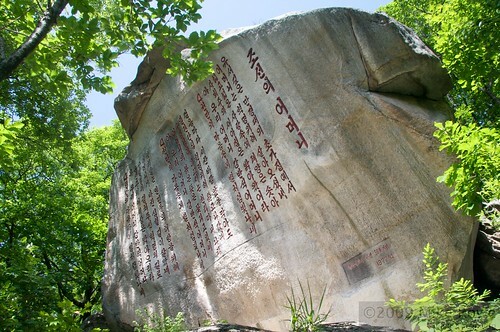 Another aspect of North Korean walking trails are the large carved rocks with insightful sayings from either of the leaders, Kim Il Sung or Kim Jong Il. They really seem to have a fetish will making them as big and impressive as possible. 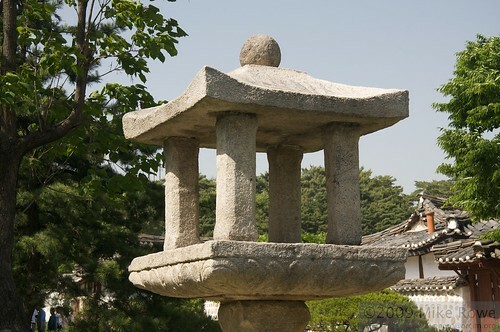 At the end of the trail, Gwaneumsa Temple. First built in 970, refurbished in the 17th century, and now a mix of new and old. 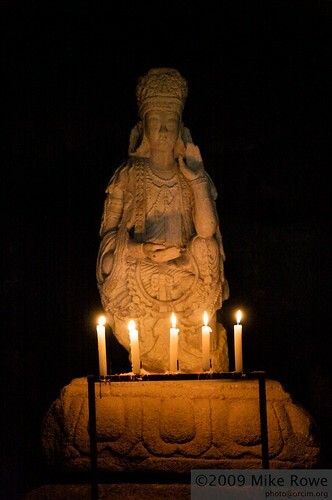 Inside a cave next to the temple is a marble statue called Guanyin, named for the buddhist bodhisattva of compassion. Unfortunately time was limited and it was time for us to head back down to the bus, and into town for lunch. 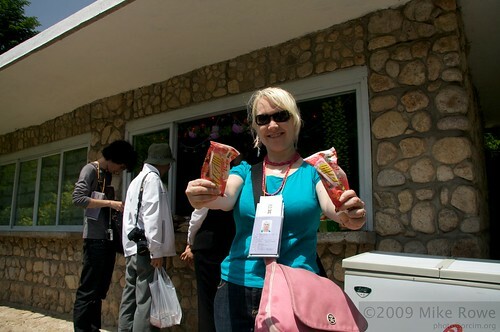 On the way we couldn’t pass up the opportunity to try some North Korean icecreams. Strawberry flavour they were slightly chewy in texture and very delicious. Lunch was in what felt like “The Restaurant”, actually called Tongil Restaurant. A traditional but modern building right in the middle of downtown. Kim Il Sung statue on one side, department store, Namdaemun and main street on the other. Lunch was anything but simple. 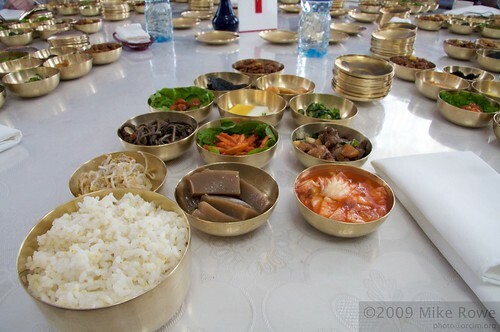 A royal feast of 13 individual dishes for each person, washed down with delicious North Korean beers. After lunch we were given some time to wander (limited) and take some pictures (more limited). Guards, army or police, monitored our every move. Pictures in one direction were allowed as long as we didn’t show people or construction, while pictures in another were a No-No. The Restaurant (on the right) and the view looking downtown. 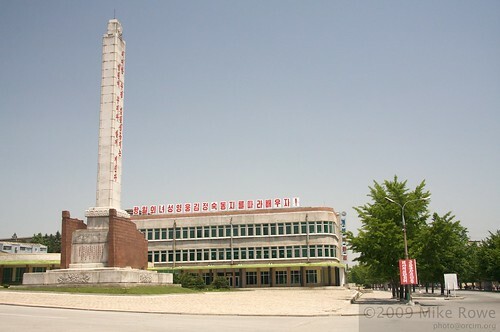 Kaesong Department store. Just the one, and it didn’t look very inviting. I would have loved to visit, but of course, not allowed. Namdaenum, or South City Gate was constructed between 1391 and 1393. 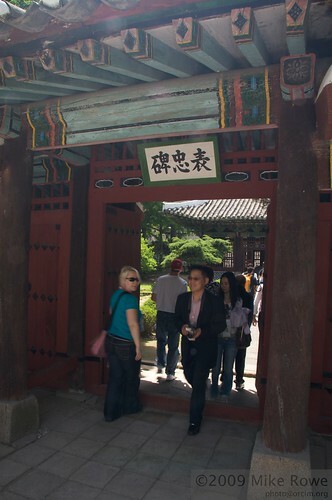 There used to have seven gates, but only South Gate is left. 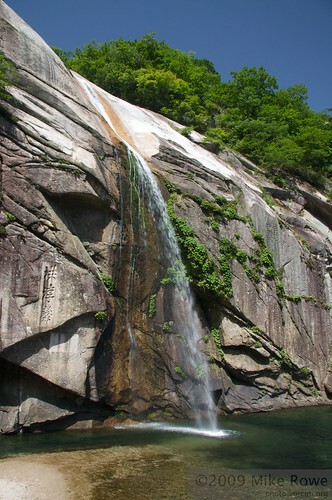 During the Korea War it was severely damaged and rebuilt in 1954. I wasn’t allowed to walk the 5m into the middle of the road to take this picture, instead a uniformed guard took my camera for me, wandered into the road, took the picture and gave the camera back. I was very surprised by this generosity towards us. As you can see, traffic isn’t much of a problem. In fact the most vehicles we saw were our own tour buses. This doesn’t mean that they don’t take traffic control seriously. No traffic lights, but police traffic controllers in the middle of the streets directing traffic. If you look carefully you might even see a single bus in this picture. 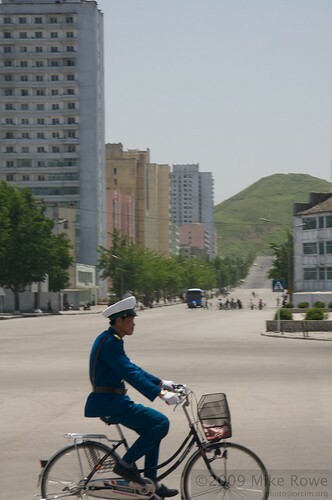 Another picture I’m not supposed to have, showing an uniformed soldier riding his bike through town. After lunch, further exploration, but another post.